4 bedroom detached home with detached double garage! Crabcroft Farm is located in Awsworth and is surrounded by open fields and scenic views. It is in a prime location with easy access to the M1, Giltbrook Retail Park and Kimberley town centre. This property has recently been fully renovated to a very high standard throughout and makes a fantastic family home. It has been brought back to life and is an opportunity not to be missed. No upward chain! 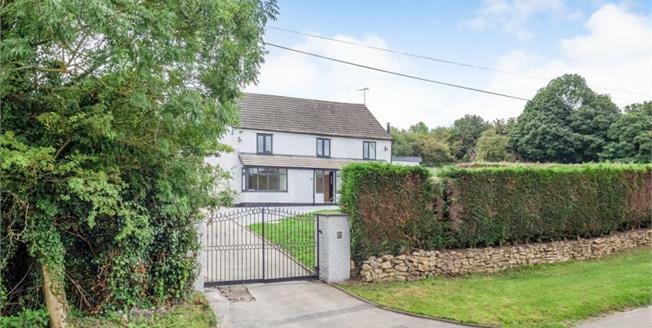 This 4 bedroom detached house is accessed via double electric gates to the front of the property with fob entry. There is an additional driveway at the rear of the property with access to a double garage. Spacious in size, with ceramic tiling throughout, oak staircase leading to the first floor, plus storage cupboard. Hallway has down lighting and a new security alarm has been fitted. Dining Kitchen - 3.40m x 7.67m: A new kitchen has been installed, wall and base units incorporating Oak work surfaces with an inset sink having a mixer tap. Integrated fridge, freezer, dishwasher and free standing Belling range cooker. Under floor heating. Spacious in size, base units have been installed with plumbing for washing machine and space for dryer. Freestanding shower with dual shower head, vanity wash hand basin and WC. Tiling to the walls and floor plus under floor heating. Log burning stove, engineered timber flooring, Bluetooth speaker system with double doors leading out to a patio area and garden. This room can be used as either an additional living area or a double bedroom. Master bedroom includes en-suite bathroom with freestanding shower, vanity wash hand basin and WC.Tiling to the walls and flooring plus under floor heating. Double bedroom with additional en-suite bathroom with freestanding shower, vanity wash hand basin and WC. Tiling to the walls and flooring plus under floor heating. Jacuzzi spa bath, separate shower cubicle with dual shower head, vanity wall mounted wash hand basin with LED, Bluetooth mirror and WC. Tiling to the walls and floor plus under floor heating. Patio area and garden to the side of the property, block paved driveway. Double garage with power, lighting and personnel door to the rear.